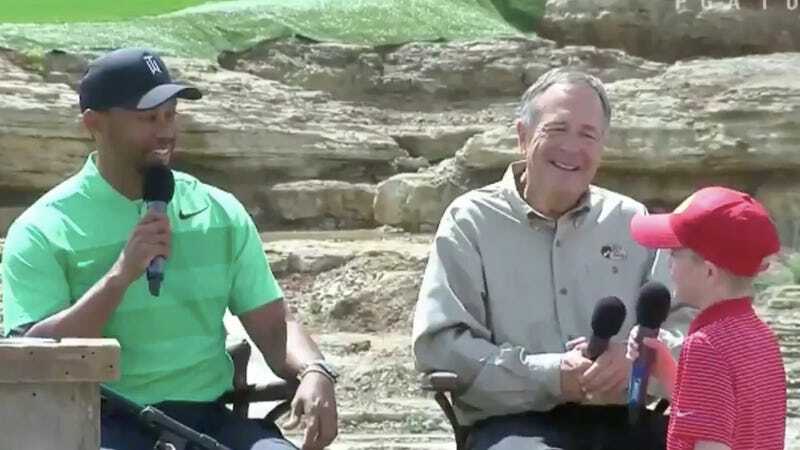 At a press event today for a new public golf course in Ridgedale, Mo., a kid reporter challenged old and fucked up Tiger Woods to a “friendly” competition from the range. Woods, sounding like he was reading a cue card, said, “There’s nothing friendly about it.” He smiled. Chuckles all around. Then he plunked his shot straight in the water. The camera didn’t show where the second shot ended up, but it wasn’t good. Woods also shared unspecific updates on his fitness. “Nine more years — nine — that’s all I got, before I’m going to beat you on the senior tour!” he said pointing at Lehman.